Reina and Christina are joined today by Kelly Roach who is the host of the top rated podcast, Unstoppable Success Radio. She’s also an international bestselling author and the CEO of Kelly Roach Coaching, plus a former NFL cheerleader and Fortune 500 executive. She was promoted seven times in the eight years and she is bringing a powerful combination of proven and profitable business growth strategies, coupled with mindset wellness and productivity here to our show today. At the beginning of the episode, we hear all about the twists and turns of life with Kelly and how that has influenced her. She shares about why building a winning team is the biggest thing as an entrepreneur and how you should serve, while making money. The trip really get into what serving your audience should actually look like and the intention behind serving. Lastly, Kelly shares the first step for you to make money while serving. Check out the show notes below to grab a productivity resource from Kelly! Kelly Roach is the host of the top rated podcast Unstoppable Success Radio, an International best-selling author, and the CEO of Kelly Roach Coaching. As a former NFL Cheerleader and Fortune 500 Executive where she was promoted 7 times in 8 years, Kelly brings a powerful combination of proven and profitable business growth strategies coupled with the mindset, wellness and productivity practices required to help entrepreneurs build a profitable business around a life they absolutely love. Kelly’s passion and purpose is in helping entrepreneurs around the world achieve exponential profit, sales and income growth. Kelly is on a mission to help 1 million people become financially free through her RESULTS coaching but also founded Campaign For Humanity, a charity initiative to support our global family with things such as clean drinking water, help for veterans, and food for those in need. You can check out Kelly’s philanthropy work and donate at www.kellyroachcoaching.com/givingback. Kelly runs business coaching programs, mastermind groups, online courses and does private consulting with individuals and organizations. Today, Reina and Christina are joined by Neely and Chloe Burch. They believe luxury should never be out of reach and Chloe and Neely have sought to create a line of handbags, shoes, wallets and other accessories that redefine a luxury. At the beginning of the episode, we hear all about these two wonderful ladies and how they have found themselves running a business together. The duo discuss how they received funding and what some milestones have been for the both of them in business. The group chat about moving forward in business and Neely and Chloe are sharing how they have been data driven. Lastly, we hear what being on Oprah's list of favorite things was like and they give us an insider peek of the behind the scenes of their favorite pieces launching this fall. We make precious things - items of quality and beauty - that are to be used for years. We believe that great design stirs our emotional connection to a product. That mark of luxury is not its price or a logo - it it the inherent beauty, quality and usefulness of something special and worth keeping. Luxury should never be out of reach. We have sought to create a line of handbags and shoes that redefines luxury. Based in New York City, Neely & Chloe is the eponymous creation of sisters Neely and Chloe Burch. Having graduated in 2013 and 2014 respectively, both sisters began a career in the fashion industry. Neely retrofitted a vintage Airstream trailer into a pop up boutique to travel the country’s rural and suburban college campuses, while Chloe cut her teeth at J. Crew as a merchant. Through these endeavours the sisters saw an opportunity to reimagine an archaic industry that encouraged low quality, unsustainable fast fashion. They found there was a void to be filled between affordable accessories and luxury brands. By renouncing the traditional retail model and selling exclusively to customers direct, Neely & Chloe are able to invest in quality, trust in design and believe that you deserve more. Today, Reina and Christina are chatting with Amber Rae who has been called a ‘millennial motivator’ by Fortune and the ‘Brené Brown of wonder’ by Mind Body Green. She is an author, artist and speaker whose work invites you to live your truth, befriend your emotions and express your gifts, her writing blends raw personal story telling with actionable aha moments. Amber has helped launch six bestselling books as Chief Evangelist of Seth Godin’s publishing experiment and started an accelerator for your life called The Bold Academy. She lives in Brooklyn and around the world with her fiancé Farhad. At the beginning of the episode we learn quickly how we can connect with Amber. She shares about the consequences about not sharing emotions and how our mindset controls every aspect of our lives. The trio explore some tools for uncovering emptions. At the end of the episode, we hear about Amber's memorable moments during her book tour. Called a “Millennial Motivator” by Fortune and "The Brené Brown of Wonder” by Mind Body Green, Amber Rae is an author, artist, and speaker whose work invites you to live your truth, befriend your emotions, and express your gifts. Her writing blends raw, personal storytelling with actionable aha! moments and has reached more than 5 million people in 195 countries. Her public art has spread to more than 20 countries, and she's spoken to and collaborated with brands like Kate Spade, Apple, Amazon, and Unilever. Amber has been featured in The New York Times, TIME, Fast Company, BBC, ABC World News, Tim Ferriss's blog, and more. Previously, Amber helped launch six best-selling books as Chief Evangelist of Seth Godin's publishing experiment and started an "accelerator for your life" called The Bold Academy. She lives in Brooklyn and around the world with her fiancé, Farhad. Today, Reina and Christina are chatting with Cassandra Le who is the curator and the content strategist and copywriter behind the Quirky Pineapple Studio which is a virtual studio that provides copywriting, content creation, brand strategy, all that and more for the creative souls and the tourism and hospitality industry. In this episode, Cassandra dives right in, chatting about the Quirky Pineapple and how she decided to take her business abroad. We learn all about what content strategy is and what some of the biggest content mistakes she sees are. Lastly, she shares about lliving abroad and having her business abroad looks like and how hard it can be personally. Today, Reina and Christina are joined by Sherry Strong who is an award-winning speaker, chef, nutritionist, food philosopher and she has traveled through the journey of sugar addiction. She is the Victorian chair of Nutrition Australia, the Melbourne president of Slow Food, and the co-founder of the World Wellness Summit. At the beginning of the episode, Sherry shares all about her addiction with sugar and how she has coped with it. She explains how sugar is like a drug, what it does to the body, and some of the symptoms of sugar addiction. The trio dicuss how hard it is to overcome food and Sherry explains that you just have to start somewhere, that no one is perfect. Lastly, we hear some of the sucess stories that Sherry has had, moving people away from their sugar addictions. Sherry is an award-winning Speaker, Chef, Nutritionist, Food Philosopher. She was the Victorian Chair of Nutrition Australia, Melbourne President of Slow Food and the Co-Founder of the World Wellness Summit. She has worked with elite athletes, billionaires, celebrities, CEO’s and everyday folk like herself to transform the way they relate to food and their body. Sherry is the founder and the creator of the Sweet Freedom Project – which includes a multi-media transformational platform dedicated to helping people get sugar-free naturally for life. Reina and Christina are back today with a mentoring session with Sam Harris. Sam is the lead VA and Founder of The Executive Studio, a studio that really helps passionate girl bosses and helping them run their businesses more efficiently. As we dive in, we're going to be talking a little bit about the concept of done is better than perfect, investing in your business, and other topics that will help you also grow your business. At the beginning of the episode, we hear about where Sam currently is with her business and what she is struggling with. Reina chats about social glue and how creating connections with people is so important. Christina talks about the idea of quality over quantity, but also just starting. Lastly, the trio chat about responding to "no's" and how to keep track of connections in your business. Sam Harris is the lead VA and founder of The Executive Studio ("TES"). TES serves passionate girl bosses in helping them run their business efficiently and effectively through professional virtual assistant services and business support. We make it our mission to connect with creatives from all walks of life and love to provide inspiration and encouragement to those on a quest to turn their dreams into reality. Reina and Christina are talking to Meghan Stolar Brown who is the manager of Two Bright Lights. She is super passionate about creating a platform to help event pros just like you, grow their brands and lead by connecting with publishers and other vendors. At the beginning of the episode, Meghan dives right in and chats all about Two Bright Lights and the strategy behind good submissions! The trio talk about honing in on your uniqueness and how that can help differentiate your work. Meghan then shares what the perfect pitch consists of for a Two Bright Lights submission. Lastly, we hear why being published is important and we hear Meghan's predictions for the wedding industry. Meghan Stolar Brown, Manager of Two Bright Lights, is passionate about creating a platform to help event professionals grow their brand and leads by connecting with publishers and other vendors. She has extensive marketing and event management experience at companies like Antony Todd Events and Roubini Global Economics, and understands the challenges and opportunities creative entrepreneurs face. Growing up with a booking agent and a wedding band leader for parents, there is no doubt that marketing and events are in Meghan’s DNA. Her love for music and events grew from singing and playing piano as a toddler, to performing in recording studios and at weddings and events in the years since. Meghan holds a degree in Music Business from New York University, and lives in New York with her husband and (if everything goes her way) their future dog, “Chet”. Today, Reina and Christina are chatting with Heidi Thompson. Heidi is the bestselling author of Clone your Best Clients and the Founder of Evolve Your Wedding Business, where she specializes in business and marketing strategy for wedding professionals. At the beginning of the episode, we hear how Heidi first got into marketing strategy. We hear all about what she loves about marketing in the wedding industry and the gaps she is seeing there. She also shares the biggest mistakes in wedding marketing and the why (and how) behind setting yourself apart. Heidi Thompson is the best-selling author of Clone Your Best Clients and the founder of Evolve Your Wedding Business where she specializes in business and marketing strategy for wedding professionals. She helps wedding professionals grow their businesses and reach their goals without going crazy in the process. Her business & marketing expertise has been featured on several wedding and business outlets including The Huffington Post, Social Media Examiner, Wedding Business Magazine, Sprouting Photographer, Photo Biz Xposed, Honeybook, WeddingWire World & she’s an advisory board member for the UK Academy Of Wedding & Event Planning. You can also join her and lots of other wedding professionals just like you in The Evolve Your Wedding Business Facebook Community. Today we have another mentoring session for you! Today Reina and Christina are talking to Omishan Ogholoh Williams of Adesuwa Events; a New Orleans-based wedding consulting business. She’s not a wedding planner, so this is going to be a super fun conversation. They're talking about how to stay motivated when you’re not seeing a lot of traction. At the beginning of the episode, we hear about Adesuwa Events and what Omishan has been struggling with. Christina and Reina dive deep to ask Omishan the hard questions about her business, like her ideal audience and what her unique value proposition are. The trio discuss many apspects of her business! Omishan Williams is the owner of Adesuwa Events, a New Orleans based wedding consulting business where she provides intentional guidance and direction to couples who desire to plan their own weddings. She works with them to help organize their plan and streamline the chaos that sometimes goes along with wedding planning. Her mission is to bring fulfillment and provide guidance to couples going through their wedding planning journeys while preparing for marriage more special than their wedding. Omishan is a pharmacist by education, a wife, and a lover of all things organized. She loves traveling, good food and wine, and celebrating all of life's special moments. Christina and Reina are talking today with Britt Rohr of Swell Press, Swell Press is a boutique design and letter press company inspired by everything southern California. At the beginning of the episode, Britt shares how she got started with Swell Press and explains all about what letterpressing is! She explains how she makes sure to stand out in her industry, by staying in her own lane and using nature to influence her work. The trio discuss the hustle mentality and we hear how Britt balances hustle with time to herself. Lastly, they discuss spending your time on things that you should be and how to hire out effectively. Founded by letterpress maven Britt Rohr in 2014, Swell Press is a boutique design and letterpress company inspired by the salt water, Strand, sunsets, and palm trees of Southern California. From one-of-a-kind wedding and event invitation suites to sleek and sophisticated stationery and business cards, every single paper product that leaves Swell Press’ studio doors is a true, intricate and original work of art, featuring signature Swell Press designs like ombré and neon edge painting, hand- painted water color borders, and custom dip dye. Under Britt’s masterful creative direction, Swell Press’s letterpress creations are an artfully crafted, individualized adventure from start to finish. Today, Reina and Christina are joined today by Bree Pair, who began blogging in 2011. After three years of being part of being part of the blogging community, she saw the different areas where bloggers were in need of knowledge to turn their blogs into full-time businesses. She founded a conference called Thrive in 2014 on her passion for seeing others succeed. That passion has driven her to continue leading and growing the Thrive conference to reach and educate even more bloggers. Breanna began blogging in 2011 and continued to blog because of the community. After three years of being a part of that community, she saw the different areas where bloggers were in need of the knowledge to turn their blogs into full-time businesses. Once Thrive was founded in 2014, her passion for seeing others succeed was fueled. That passion has driven her to continue leading and growing Thrive to reach and educate even more bloggers. Breanna is currently traveling around the country with her husband, Brannon, in their travel trailer. They’re enjoying working from the road and meeting bloggers and other entrepreneurs during their travels. You can follow her @breepair on Instagram. Reina and Christina are joined today by Jordan Gill of The Kolada Group, she is also the host behind The System Saves Me podcasts. At the beginning of the episode, Jordan dives right in and talks about how the Kolada Group was started. She shares about how she transitioned from working a corporate job, to running her own business. The trio then chat about Jordan attending over 30 events last year and Jordan shares how she makes that happen and why in-person events are important to her. Lastly, they discuss systems that help make her wants a reality and what her triple-threat program is. Reina and Christina are joined today by Elle Drouin. Elle is a New York City based product stylist photographer and digital marketing strategist. After several years working as a director of marketing and digital strategy for ecommerce brands, Elle has launched her own business to focus on helping other women-build brands that are as profitable as they are pretty. At the beginning of the episode, we learn how Elle's background in finance has helped shape her and helped her in her path to her current business. Elle shares about the three main facets to her business and how she manages to fit them all together. The trio talk about stock photos and the fear of posting the same thing as others and Elle shares some options for making stock photos personalized. Lastly, Elle chats about how she stays focused by batching each week of the month differently in her business. Elle Drouin is a NYC-based product stylist, photographer, and digital marketing strategist. After several years working as the Director of Marketing & Digital Strategy for e-commerce brands, Elle launched her own business to focus on helping other women build brands that are as profitable as they are pretty. In addition to creating custom imagery for beauty and lifestyle brands, Elle is the founder of the Styled Stock Society, a stylish stock photography membership for female entrepreneurs. Elle is also the social media director for her Instagram-famous dog @mochiandthecity (who is far more popular than she'll ever be). Elle and Mochi have been featured on Entrepreneur, Refinery29, and the TODAY Show and have collaborated with brands like American Express, Disney, Google, and The Ritz-Carlton. When she's not styling, shooting, or strategizing, you can find Elle binge-watching Bravo TV, hoarding gold office supplies, or eating her way through Brooklyn with her husband Zach. Today, Reina and Christina are talking with business coach, Ashley Gartland. She works with women entrepreneurs who business is doing pretty well, but who feel like a hot mess behind the scenes. Ashley jumps right into the episode, chatting about how she found herself in the coaching world. The trio discuss intentional growth and the why behind business owners wanting fast growth. She shares why you have to define your own measurement of success and why staying focused will help you reach your goals. We hear about some timeless marketing stratgies to focus on and tools to help you stop feeling like a mess behind the scenes. Lastly, Ashley talks about how far holds us back as entrepreneurs and how to combat it. Ashley Gartland became an entrepreneur the day she graduated college and has been enjoying the perks of the lifestyle ever since. As a business coach, she works with women entrepreneurs whose business is doing well but who feel a hot mess behind the scenes - and they know it's holding them back from reaching the next level. She helps them simplify their business and build a stronger foundation so they can experience more growth and fulfillment in their work and more freedom in their life. Before launching her coaching practice, Ashley spent a decade working in public relations, magazine publishing, copywriting, digital publishing and event planning. As a writer, she contributed to high-profile magazines such as O, The Oprah Magazine, Runner’s World, Sunset and Prevention and honed her editorial skills at successful digital media brands including Tasting Table and PureWow. She is also a published author twice-over. Ashley is passionate about helping women drop the cookie cutter approaches and instead grow their business their way through the lens of simplicity. She is a Certified Life Coach who received her training through The Life Coach School. Ashley lives in Portland, Oregon, where she spends her time outside work trail running and raising two little girls. Today Reina and Christina are talking with Terra Dawn who is the owner of the Uncork Your Dork website and membership site. At the beginning of the episode, we hear about how Terra created Uncork Your Dork and what caused her to create a membership site. We learn all about recurring revenue and why it can be an important stabilizer in your businesses income. Terra shares ideas of types of recurring revenue and how tech ties into it. Lastly, the trio talk all about membership sites and learn the best sites Terra has seen work. Terra Dawn is the owner, operator and head dork over at the UncorkYourDork website! In addition to publishing frequent articles to the blog, she runs the Wham! Bam! Business Plan membership site to help show budding entrepreneurs the SIMPLE path to creating a dependable and recurring revenue in their small business. Whether memberships are up your alley or something slightly more simple...like paid newsletters or masterminds, Terra is dedicated to helping business owners leave the launch to launch mentality behind them. Today, Reina and Christina are chatting with YouTube strategist, Trena Little. Trena helps online business owners create video content strategy that works for your business. At the beginning of the episode we learn how Trena got started in her business and what some of her tips are for starting to create video content. She shares what her workflow looks like for batching videos, plus gives us an idea of what having a YouTube strategy looks like. The trio discuss hangups of getting on video and we learn why YouTube is the most effective video content solution. As a video and Youtube strategist, Trena helps online business owners create a video content strategy that works for their business. Being a busy business owner herself, she understands the importance of making video simple and painless but effective and lasting. Her Youtube videos are her sales team and they do the heavy lifting for free! When she’s not in front of a camera, she’s in her “mom-iform” of yoga pants and a tee chasing her 2 kids around alongside her husband, her high school sweetheart. Today, Reina and Christina are joined by Courtney Johnston, who is the founder of The Rule Breaker’s Club. She teaches women how to package and sell their brilliance. At the beginning of the episode, we hear all about how and why Courtney started the Rule Breaker's Club. She shares with us why you should be packaging your services and what her rainbow of sales concept is. The trio discuss engaging with your audience as well as getting clarity from them. Lastly, Courtney shares about sales pages and how to show some personality in your business. Courtney Johnston is the founder of The Rule Breaker's Club where she teaches women how to package and sell their brilliance. She’s pretty much the only person who can make writing sales pages fun (hint: it involves rainbows and pots of gold). Her work has been featured on Inc.com, FastCompany.com, CreativeLive, and the Huffington Post. She’s from Michigan, started her business in Paris, and currently lives in Vancouver, BC with her fiancé, Mohammed. Learn Courtney’s 14-part sales page recipe at www.RuleBreakersClub.com. Reina and Christina are joined today by Cailen Ascher who is a lifestyle design expert and the creator of the 3-Day Workweek. he mostly helps women bring intentional design into their lives and businesses that they can stop living by default and start creating success on their own terms. We start the episode with Cailen describing what exactly intentional design is and the mindset behind having a purposely designed life. She shares with us what her work week looks like and talks about the team that she has. Lastly, Cailen shares why it is important to give yourself time to pause. Cailen Ascher is a Lifestyle Design Expert and creator of the 3-Day Workweek Program. Through her programs, products and coaching, she helps women bring intentional design into their lives and businesses so that they can stop living by default and start creating success on their terms. Cailen and her work have been spotlighted in Business Insider, Huffington Post, Entrepreneur on Fire, The Create Podcast, MindBodyGreen, Gary Vaynerchuk’s One-a-Day Q&A, and dozens of other podcasts and popular publications. During her 4-day weekends Cailen enjoys time with her two little daughters and husband. Get her free 3-Day Workweek Schedule at www.CailenAscher.com. Reina and Christina are joined today by Nicole Miyuki Santo, who is a freelance artist, graphic designer, teacher and now published author. We are so excited to talk to her about her book By Hand, which if you guys have not picked up a copy of this yet, it is the most gorgeous thing you have ever seen. Nicole started in the modern calligraphy scene fairly early and at the beginning of this episode we hear how that happened. Nicole shares about her book and what the creative process looked like for it, behind the scenes. She gets really vulnerable and talks about how the journey has made her have feelings that may not have always felt good, but also shares the exciting moments along the way. Towards the end of the episode, the trio discuss what happiness can look like in business and how that can differ for everyone. Nicole Miyuki Santo is a freelance artist, graphic designer, teacher, and published author. Since 2015, she has taught in-person hand-lettering workshops empowering her students to tap into their creativity and develop their own unique voice. She is a kind spirit and truly believes that everyone, kids and adults both, can enjoy using their own two hands to create. Her work has been featured in numerous publications, including Martha Stewart Magazine, and she is the author of By Hand: The Art of Modern Lettering. Nicole lives in Los Angeles, California. Visit her online at nicolemiyuki.com and on Instagram @nicolemiyuki. Today, Reina and Christina are joined with Cheryl Sutherland, who is the founder behind PleaseNotes, a for-purpose company of affirmation-filled products, like journals, and notebooks and just everything stationary that makes our hearts sing. At the beginning of the episode, Cheryl dives in to tell us all about how PleaseNotes got started! She shares why taking time for yourself is important and what made her make the decision to have a physical product and not sell a service. We learn about how journaling can be useful and how to run a business that is driven by purpose. Towards the end of the episode, the trio discuss networking and why you need to do it well. 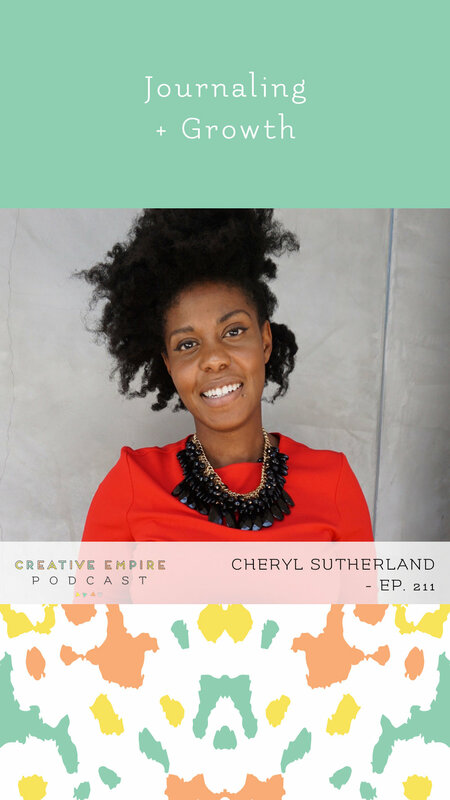 Cheryl Sutherland is the Founder of PleaseNotes, a for-purpose company of affirmation-filled products. Creator Cheryl felt restless and underwhelmed at her 9 to 5. 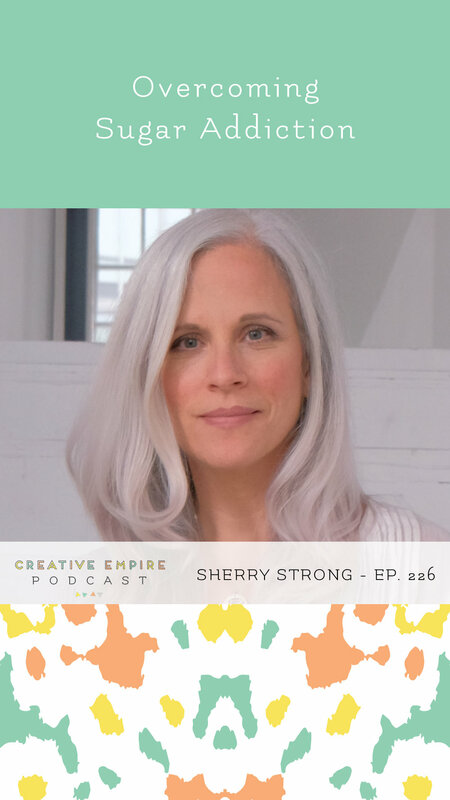 After spending over 1400 hours in learning and facilitating personal development, coaching, and reigniting her inner creativity, Cheryl created a company that inspires women to step into their own power by building confidence, clarity, and creativity. In 2016, Cheryl started her company with one item, the PleaseNotes Sticky Note, and fully launched the brand with a successful Kickstarter campaign. Since then, PleaseNotes has expanded to include a suite of products that cater to customers worldwide, including Spain, UK, Canada, Latin America and Asia. Each purchase contributes 10% of the profits to support women empowerment initiatives in her local community. PleaseNotes has been endorsed by renowned changemakers Les Brown and Monique Coleman with the words, “This is a gift, this is special and extraordinary and deserves to be shared with the world.” As a women's empowerment expert and entrepreneur, Cheryl Sutherland and PleaseNotes have been featured InStyle, Huffington Post, Fast Company, American Express OPEN Forum, Thrive Global, Youngry, and StandOut Publications. Cheryl resides in between Los Angeles and Toronto, Ontario.